It was a tale of two halves as the Lady Flames (17-10, 13-5 Big South) women’s basketball team got the win 80-69 over the Winthrop University Eagles (20-7, 14-4 Big South), the Big South Conference leaders, Saturday, Feb. 22, in Liberty’s final home game of the season. 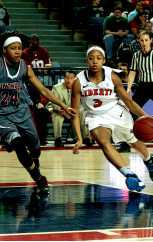 Despite getting off to a slow start, trailing 16-5 with 12 minutes to go in the first half, Liberty rallied from the perimeter. They hit 80 percent of its three-point shots in the half, including a momentum-shifter from guard Emily Frazier five seconds before the halftime buzzer. “The first half, it just wasn’t clicking for the post, but we were getting good looks from sharp shooters on the perimeter, and we knocked some big shots down,” Head Coach Carey Green said. One of those sharp shooters, sophomore guard Jaymee Fisher-Davis, went 4-5 from behind the three-point line, spurring the Flames comeback with 6:30 to go in the first. Though three-point success made the difference in the first-half, it was second-half paint play that won the game. Winthrop adjusted its defense to control Liberty’s outside shooting from the first half, putting stifling pressure on the perimeter and forcing Liberty to rely on the inside. Redshirt sophomore center Katelyn Adams provided the necessary spark in the post, going 7-10 from the field, garnering three rebounds and assists and four critical steals. “We didn’t have great energy starting out, but toward the end of the first half, we really picked it up,” Adams said. Adams and her team expressed similar excitement looking forward to the fast-approaching Big South Tournament. The Lady Flames return to action when they travel to take on the Radford University Highlanders Thursday, Feb. 27 at 7 p.m.